PEARL HARBOR - Military and civilian personnel responded to a simulated earthquake and tsunami scenario July 12-13 as part of a task force that included non-governmental organizations, and the State of Hawaii during the Rim of the Pacific (RIMPAC) exercise at Joint Base Pearl Harbor-Hickam. This year for the first time, all of Hawaii’s acute care hospitals participated in the humanitarian assistance and disaster relief (HA/DR) exercise. In the exercise scenario, a major earthquake and tsunami have struck an island nation inflicting massive casualties, aftershocks, and extensive infrastructure damage. The island nation is requesting support from non-governmental organizations and the military, which have formed a combined task force under the command of Japan Maritime Self-Defense Force Rear Adm. Hideyuki Oban, vice commander, Combined Task Force, as the disaster has exceeded the nation’s capability to respond to the needs of its residents. Military staffs and medical planners from 10 countries assisted in the simulated HADR efforts including the U.S., Japan, Chile, Canada, Vietnam, Germany, New Zealand, Australia, the Republic of Korea, and Peru. "RIMPAC 2018 has been a valuable experience for my professional development and building new relationships with partner nations," said Chilean navy Lt. Cmdr. Sergio Huidobro, current operations officer for the Chilean fleet and a battle watch captain for the HA/DR scenario. "As the battle watch captain of Combined Task Force 18, I oversee the humanitarian assistance and disaster relief operations by analyzing the situation and deliver real-time assessments to the vice commander of the Combined Task Force for decision making to help maximize and accelerate getting humanitarian aid to those in need." The exercise was heavily focused on refining the civil-military relationships that ensure an effective disaster relief response and includes participation from several organizations including the United Nations Office for the Coordination of Humanitarian Affairs (OCHA), U.S. Agency for International Development (USAID) Office of Foreign Disaster Assistance, Hawaii Healthcare Emergency Management Coalition, Hawaii Disaster Medical Assistance Team, Harvard, Brown, Oxford, Yale, Stanford, Lehigh, Massachusetts Institute of Technology (MIT), American Red Cross, International Federation of Red Cross and Red Crescent, Hawaii State Department of Health, Kailua Community Emergency Response Team (CERT), Ewa CERT, and Team Rubicon. 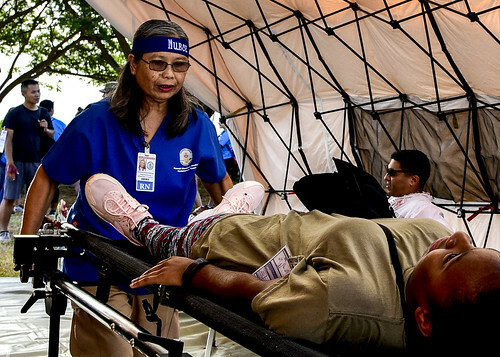 The mass casualty portion of the HADR exercise features more than 300 volunteers portraying patients who will be triaged in mobile hospital units on Ford Island, and transported by helicopter and ambulance to hospitals on six islands. For the first time, all of the acute care hospitals in the state of Hawaii are participating in the RIMPAC HADR exercise and will receive certifications toward their annual requirements. Naval Expeditionary Combat Command (NECC) units, a Fleet Survey Team, Military Sealift Command hospital ship USNS Mercy (T-AH 19), the Naval War College, and U.S. Army, U.S. Marine, U.S. Air Force, and U.S. Indo Pacific Command assets participated in the training. Twenty-five nations, 46 ships, five submarines, and about 200 aircraft and 25,000 personnel are participating in RIMPAC from June 27 to Aug. 2 in and around the Hawaiian Islands and Southern California. 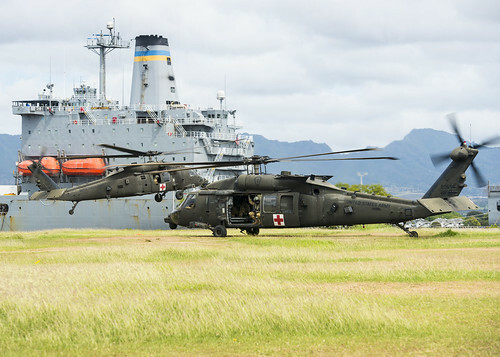 The world’s largest international maritime exercise, RIMPAC provides a unique training opportunity while fostering and sustaining cooperative relationships among participants critical to ensuring the safety of sea lanes and the security of the world’s oceans. RIMPAC 2018 is the 26th exercise in the series that began in 1971.